Motocarb stock a range of connectors to enable you to mount your carburettor. These connectors are made in the UK to our own specification. They have 3 internal dimensions. A spigot diameter at each end to accept the carb and manifold. A bore diameter which is normally the same size as the carburettor bore. Straight connectors are supplied with 2 x 9mm narrow band stainless clips. Please order using the dimensions below. We have many other size combinations in stock and can order "specials" to your specification. Usually about 10 day delivery. We can now also supply the above connector with a standard Mikuni 40mm carb spigot diameter and either a 32mm or 34mm bore diameter. This allows you to fit the Mikuni VM32, VM34, TM32, TM34 aftermarket carburettors to your Suzuki. These flanged adapters are made in the UK and are the best quality you will find. Supplied with a 9mm narrow band stainless clip. 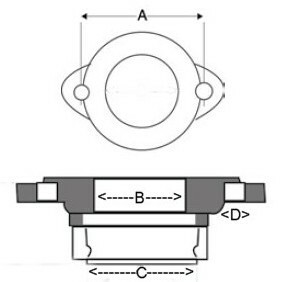 Flanged adapters are identified by 4 measurements. C: spigot diameter. This is the same size as the outer diameter of the carb spigot (mm). D: bolt hole diameter. This is normally machined to be a clearance size for the bolt. 2" x 26 x 35 x 5/16"
2" x 28 x 35 x 5/16"
2" x 30 x 40 x 5/16"
2" x 32 x 40 x 5/16"
2" x 34 x 40 x 5/16"